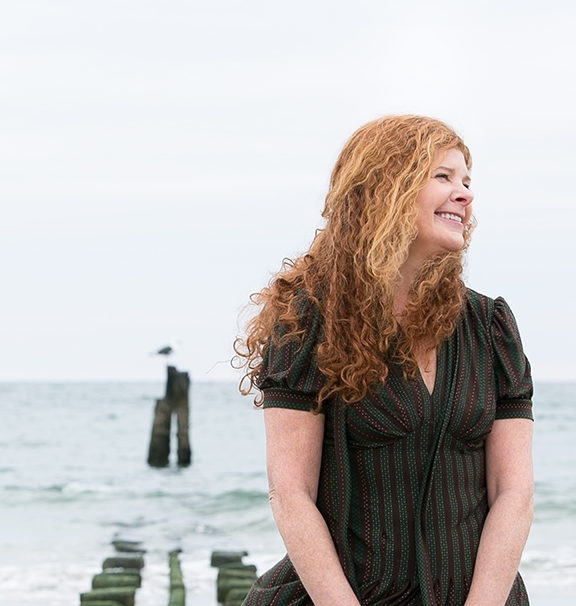 Jill Eisenstadt’s 1987 and 1991 novels “From Rockaway” and “Kiss Out” earned her a bright literary reputation and following, even membership in the media-manufactured “brat pack” of writers including Bret Easton Ellis and Donna Tartt. Though she’s written nonfiction since then, like “Swell,” released this summer, was Eisenstadt’s first novel in 26 years—a period in which she raised three girls. Swell tells the story of a family of New York City transplants—with two daughters and a third on the way—who, after 9/11 affects their neighborhood, move out to the Rockaway Beach house where an elderly woman named Rose once murdered her son (yep, you read that right!) and got away with it. For the very pregnant Sue, the matriarch of the transplanted clan, the price of this house, a gift from her surly father-in-law, was conversion to Judaism. And as the date of the celebration grows closer, chaos looms—especially when Rose, who was supposedly sent to a nursing home, shows up at the door. In the interval between published novels, Eisenstadt raised three daughters and observed the world around her in nonfiction and notebooks. She talked to Kveller about Jewish holidays, diaries and writing unlikable, even homicidal, moms. Kveller: I know you write extensively in notebooks. Did that start with being a mom or beforehand? It started way before parenthood. When I was younger, I always kept journals–my journals from when I’m an adolescent were very fictional. I was very aware of a reader in the future, trying to make my life sound exciting, saying “all these boys like me”–it was all inflated–but mixed in with what I had for breakfast. Once I became serious about writing, my journals became less autobiographical. They were filled with things I overheard, descriptions—my closest friend was an artist, she was always sketching and this was my version of that. It became such an obsession that it kind of got in the way of my writing. How did parenthood interact with those journaling habits? As a mom, I wrote down a lot of what my kids said, and that was a refuge when things were overwhelming. You think you’re never going to forget the hilarious thing your kids said, but you do—and then you can read it back to them and they love it. So there’s a bunch of real stuff, even in “Swell,” that I took from my journals. I really recommend it–write down those cute things, the littlest, most mundane things, that you think you won’t forget. Although I will say, a mom journal is great–but my kids do criticize that I didn’t take enough pictures! Can you talk a bit about how being a mom affected you as an artist and writer? Do you or did you keep some kind of schedule? I should have been more disciplined and scheduled—but as you know, this was my first novel in 26 years. Honestly, I don’t know how people write novels and are moms and also teach and make money. I was trying to hang on to doing some freelance work and just struggling to have my own identity, as we do! I was writing, but it was about trying to keep my foot in the door, and having some contact with the outside world. So I was mostly doing journalism and teaching for jobs when the kids were little. I tried to scribble fiction, but being a parent does hit that spot of fulfilling your creativity already. It satisfied me in a way that I wasn’t compelled so much, in those years, to be making stuff up in my room alone. 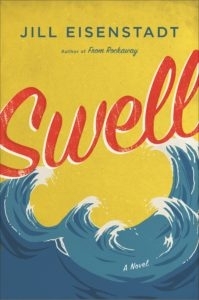 Is there a lot of pleasure to be found now in writing flawed mom characters like the ones in “Swell”? Well, it was really challenging to make a mother who’s going to kill her son seem credible! I tried to make Rose seem real and have her actions explainable and enter into this crazy paranoid mind of hers, while also being entertaining. She was the germ of the book, though, so I enjoyed it. With Sue, it was more autobiographical. She’s a lot nastier and totally different from me, but she was fun to write–just getting out some of those horrors of pregnancy in the summer, and all the things people say to you–I didn’t even get into all the nursing stuff! I have three daughters and I’ve often wanted to write essays about raising girls, but I’ve shied away from it because their privacy is important—so in fact putting raising girls in fiction made it more interesting, because I could put my own younger self in a blender with them. What inspired you to write the house-in-exchange-for-conversion plotline? I’m married to a non-Jew. In my own family, I’ve noticed people care a lot about whether their kids marry Jews even if they’re not religious themselves, and I’ve seen at least one conversion that seemed slapdash. Actually, I originally had the idea for a story where the daughter-in-law is forced into conversion and then becomes more religious than the parents and they can’t eat at her house. I never finished the short story, but then when I was really into the book, I thought I would put that in. I have often struggled in my own life because I find people around me become religious on the holidays all of a sudden—and I get annoyed by blind tradition. I really want to know why we’re doing something and what it means. Are there any holidays that do resonate on that deeper level for you? Rosh Hashanah always seems like a much better time to celebrate a new year than the middle of the winter. And taschlich, too. Since I grew up on the ocean, throwing the bread into the water as a physical act felt cleansing and important—and easy to explain to kids. I want it to have meaning. I don’t want them to be tortured trying to sit still in their itchy clothes, which is what my life was like. What are your favorite books to read with your kids? Any surprises? Do you have a favorite Yiddish word? Well, it’s Hebrew, but: Sheket! It was said to me a lot.